Is there a better alternative to Signer for PDF? Is Signer for PDF really the best app in Project Management category? Will Signer for PDF work good on macOS 10.13.4? Signer for PDF allows you to easily sign PDF documents, and makes electronic document signing painless. Optimize your paperless workflow You might have to print, sign manually, scan and send back in the past. Now PDFSigner makes a difference. You don't need to waste any paper, everything can be done digitally and fast. Operational excellence It takes only three steps to sign a PDF: 1. Open a PDF document. 2. Draw or insert your signature image, type your favorite texts. 3. Save, or print the signed PDF files. Signer for PDF needs a rating. Be the first to rate this app and get the discussion started! Flexible ways to create your signature You can personalize your signature by several ways. 1. Typing text content, you can customize the font style, color etc. 2. 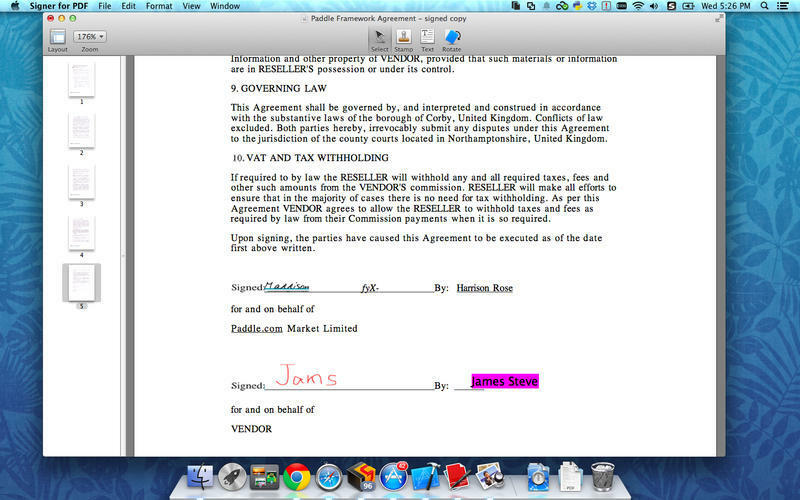 Drawing using trackpad or mouse, and insert the signature with transparent background into PDF easily. 3. Insert any existed digital signature image from your local disk. PDFSigner lets you insert your signature or image files to anywhere within the PDF. Content embedded into the PDF PDFSigner is actually a simple PDF Editor. Text, signature, images you added are embedded into PDF. Moreover, they cannot be deleted in PDF Reader. Once you save the edited PDF, you can't change the placed text or remove the signature. User-friendly interface, all the features are listed in the toolbar. Allow you to add checkmark stamp when you review the PDF. Record your signatures or images automatically for re-use. Print the signed PDF document directly from the app without saving and printing from Preview.